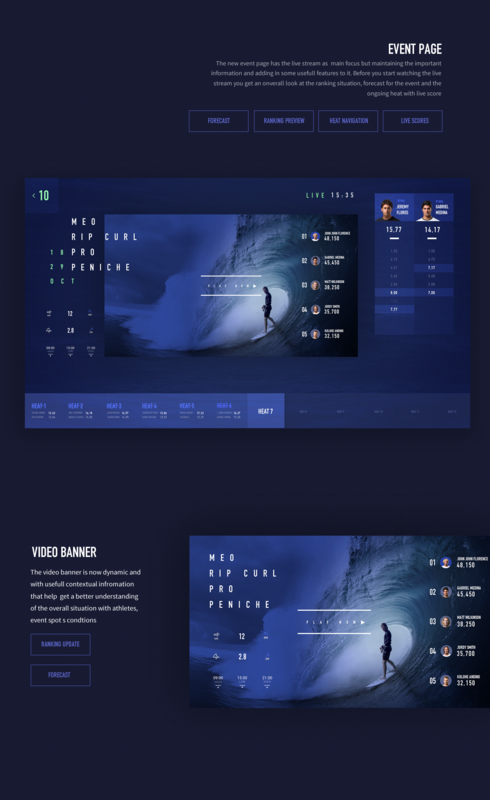 World Surf League Apple TV app is a product design concept created and shared by Luis Vaz. If you are a fan of professional surf, like me, you watch all the events of the season via the WSL (World Surf League) app and cast to a TV. It would be wonderful having a proper TV app that could take advantage of the medium to provide a immersive experience. Luis did that with his concept project. Despite the theme being a bit too dark I love the elegant typography and the useful way he display the content. This is a concept test and WIP for a new WSL Apple TV App focused on improving the experience of WSL live stream and events info. The world wide interactive map is the core of the navigation and the events page are now upgraded with important and contextual information as well as the possibility of accessing all content from previous heats and events easily. The World Surf League is a governing body for professional surfers and is dedicated to showcasing the world’s best talent in a variety of progressive formats. It was known as the Association of Surfing Professionals from 1983 to 2014. Luis Vaz is Owner and founder of Canvaz Design Studio. Working with big clients like with Stack.com (Creating Mobile apps for top athletes like Dwyane Wade and Adrian Peterson and web interfaces for Coaches) with personal projects and startups like Breeze (surf forecast made simple), Onebiller (one stop shop for all your bills). Niiiws (Newspaper aggregator) and Muchbeta (Saas company). A couple days ago, we stumbled across an image while putting together a Daily Design Inspiration for you guys. We are sharing this cool and yet useful Powerpack called Nomad where there’s one feature that could change it all or not but it’s quite awesome to share. You’ll be able to find it anywhere through your phone. You will say that how you can lose a powerpack? I happen to have an unhealthy obsession with candles that smell amazing so when we received a delivery from Keap Candles out of Brooklyn, NY my day was made. Upon opening the beautifully packaged discovery set of four tea light candles my olfactory senses were in heaven.